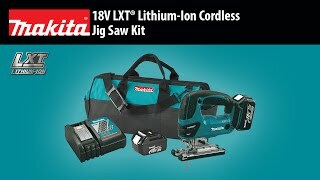 Makita’s 18V LXT® Lithium-Ion Cordless Jig Saw (model XVJ03Z, tool only) seamlessly combines precision and power with the lowest overall weight in its class. The XVJ03Z has a range of precision and comfort features for precise jig saw cutting performance, including less vibration and lower noise for more control and comfort. 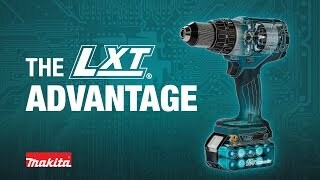 The XVJ03Z features a Makita-built high torque motor that produces a 1” stroke and 0-2,600 strokes per minute (SPM) for fast and efficient cutting. In addition, the XVJ03Z has lower vibration and less noise for more control and comfort. The XVJ03Z has four position cut settings (3 orbital and one straight) for fast and efficient cutting in all applications and a “tool-less” push-in lock system for quick blade changes. The blade roller guide is positioned close to the work piece for precision accuracy in straight and bevel cuts. The XVJ03Z weighs only 6.1 lbs. (with battery, sold separately) with a more compact design at 10-1/8” long and an ergonomic shape that fits like a glove for reduced operator fatigue. The two-finger variable speed trigger switch is easy to handle, even with a gloved hand. XVJ03Z is also equipped with a built-in L.E.D. light that illuminates the work area for more efficient work. The XVJ03Z has less noise, less vibration and less weight for more control and comfort. It is engineered for professional woodworkers, cabinetry makers, specialized residential construction workers and any pro-contractor who requires a best-in-class engineered cordless jig saw. Length of Stroke : 1"
Max. Cutting Capacity at 90° (wood) : 5-5/16"
Max. Cutting Capacity at 90° (steel) : 3/8"
Max. Cutting Capacity at 90° (aluminum) : 25/32"
Shipping Weight : 5.5 lbs.